I’m going to try to post a physics, astronomy, or other science-related image every day from now until Christmas, in the tradition of Advent calendars. Some images may be ones you’ve seen before; some may even be ones I’ve used on this blog previously. The point isn’t to be completely original every day, but to share some of my favorites, and to highlight the beauty of the Universe we inhabit. I know some people think every Advent calendar must contain chocolate. To those people, I say: I’ve got my chocolate, you can get your own. Of all the awe-inspiring objects in our Universe, spiral galaxies are some of the most striking. Our own galaxy, the Milky Way, is a spiral galaxy, although we sadly can’t see exactly what it looks like, since we’re embedded deep inside it. 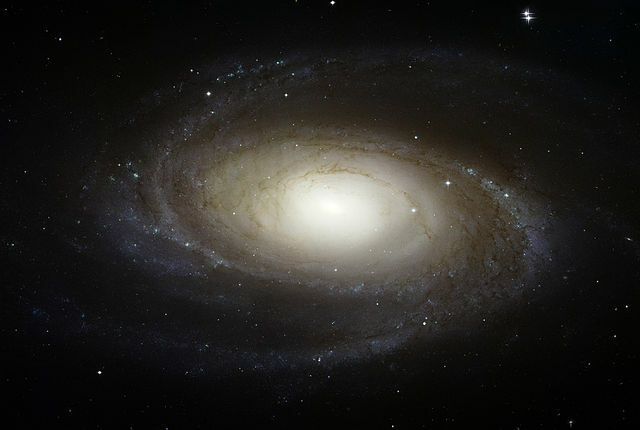 However, most large galaxies in the cosmos are spiral galaxies, and of those, M81 stands as one of the most beautiful. The galaxy lies in the constellation of Ursa Major, though you can’t see it without a telescope, even though it spreads out over a portion of the sky roughly the size of the full Moon. (Galaxies are big, but their light comes from many stars, so even the brightest ones don’t appear very bright from Earth.) M81 is relatively nearby—”only” 12 million light-years away, meaning we see the galaxy today as it was 12 million years ago. Its closeness means the Hubble Space Telescope was able to image details within the galaxy, including individual stars and star clusters. The central black hole in M81 is about 15 times more massive than the Milky Way’s black hole. Simply amazing. Thank You. Plese post more pictures. I would be interested to know if you have enough magnification to find the remnants of the Apollo moon landings? Thanks! The answer to your question is “yes”, so keep an eye out for a later entry.